Pretty Pink Posh 2nd Birthday Blog Hop! Hello and welcome to Pretty Pink Posh 2nd Birthday Blog Hop! I am so privileged to be part of Pretty Pink Posh team from the beginning! Paulina is such an amazing person. She is hard working, approachable, sweet, organised and enthusiastic! I love working with her and her amazing designs of dies and stamp set. Not to mention the beautiful colourful sequins and confetti! So thank you for having me on your team, Paulina! All the very best for the future and wishing Pretty Pink Posh many more birthdays in the furture. This is the second day of the birthday celebrations. Yesterday was the first. 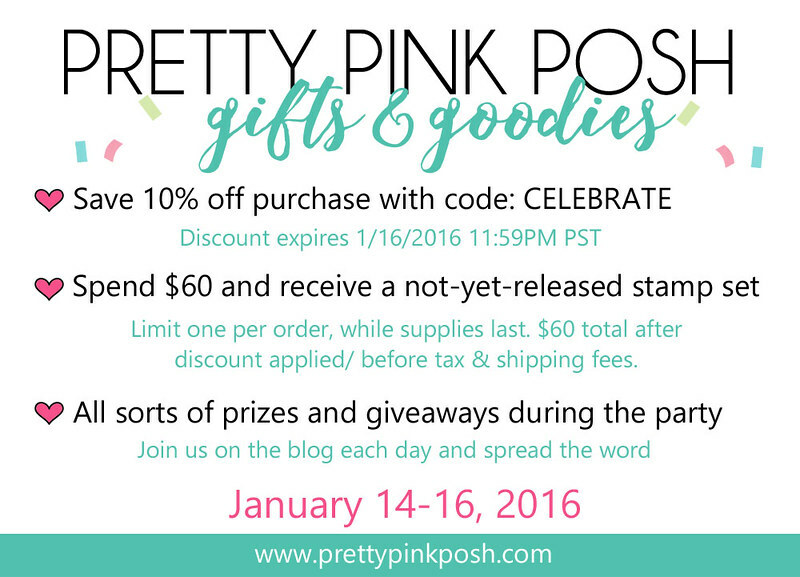 If you missed it, head over to Pretty Pink Posh Blog and hop the hop! There are plenty of prizes to be won. For today’s blog hop you should come from Melody Rupple‘s blog. If not don’t worry, I will list all the designers participating in the today’s blog hop later in the post. I have two cards using Pretty Pink Posh dies and sequins and a video to share today. Hope you enjoy my projects. This is my first card using Pretty Pink Posh Stitched Banner Duo die set and Sweet Pea sequins mix! My card is inspired by Sweet Pea sequins mix by Lisa Elton! I love the pinks, greens and white sequins in the mix. So pretty! I decided to layer the Stitched Banner dies add a big bold sentiment and embellish with the sequins from Sweet Pea mix. I die cut four stitched banner from white cardstock and one using gold mirror cardstock. I sponged Spun Sugar, Worn Liptstick and Abandoned Coral distress inks on the four white die cuts. Spattered them with water and set aside to dry. I stamped the sentiment from the new Roses for You stamp set by Simon Says Stamp on the bottom of the white card base. Coloured the sentiment with copic markers. Then stamped the leaves and coloured with copic markers again. Then I layered and adhered the stitched banners on the top of the card front and embellished with sequins from Sweet Pea sequins mix. My second is a similar layout except this card is inspired by Share Kindness Sequins mix. I have a video tutorial showing how I made this card. You can watch the video in HD on my You Tube Channel. If you like my video please give me a thumbs up! Also subscribe to my channel. I will have more videos coming every week. Here are the both the cards together. As a bonus, I have another card using the free stamp set called Birdie Notes. If you purchase more than $60, this stamp set is free. No code nor die you have add this stamp set to your order. This set will be added automatically to you order if your order is $60 and more. Details later in the post. I love love the chick in the Birdie Notes stamp set. Absolutely adorable. In fact the entire stamp set is very cute. This is a card I made using the stamp set. Background is pattern paper from an old Pink Paislee paper pad. I think it was last valentine’s release paper pad. I then used Scallop Frame die cut in black to frame the chick and the envelopes. The chick and the envelopes are copic colouored, fuzzy cut and adhered suing foam adhesives. I made a slit on the beak of the chick and slid the smaller envelope inside. The sentiment is simply stamped on a piece of white cardstock, trimmed and adhered. I brushed the envelopes with Wink of Stella clear shimmer pen. Finally embellished with Lemon Drop 6mm and 4 mm sequins. Hope you enjoyed my projects today! You next stop in the hop is to Maureen Merritt‘s blog. Here are the list of all the designers participating in the blog hop today! There is a lot of prizes. I mean LOTS, Paulina is giving away! So make sure you leave comments on all the blogs on the hop. Happy Hopping! Beautiful cards!! That chickie is so cute!! Love it! 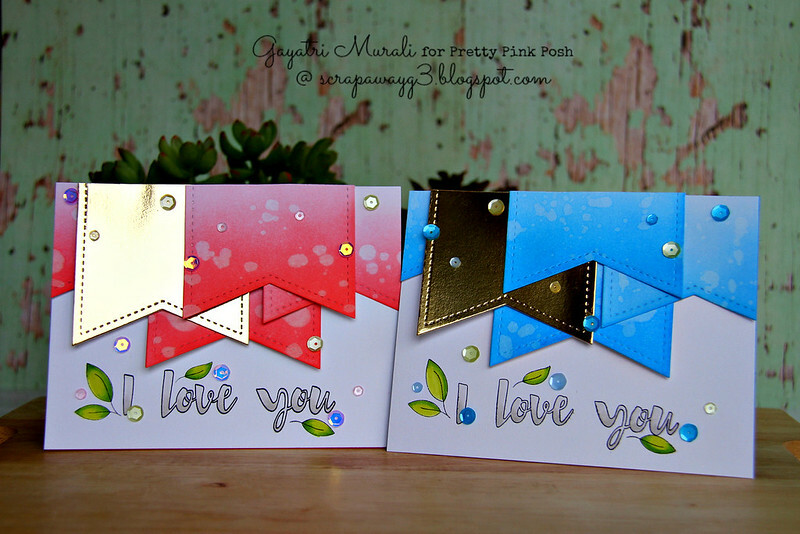 Love all 3 cards, the first two are a lovely layout and look great in both colour combos! The one with the chickie is super cute! I love the stitching for the cards that used banner dies! Love the layered look! Fun way of using the banner dies! Loving the new stamp set–super cute. That little bird is the cutest thing ever! Love that card! Great cards, but I have to admit that little chick has stolen my heart! Really really love your last card – definitely one of my favs today! Just love the colors in these cards. The black really pops. Beautiful cards! Colors are lovely! I love the layers on the first card! However, the second card is so me! I love the bird with his little envelope! It makes me so happy! Thanks for the video…and the view of the SSS Roses for You set. The bonus birdie is a delightful bonus! Your cards are so pretty. The banners are really awesome with the stitching. I love the little chick card. I have enjoyed seeing how everyone has used their sequins. I have a hard time making a card without sequins these days. Thanks for sharing. Oh my, I love your little chick, the newsprint with black frame, she just pops! Such colorful cards. Thanks for sharing. Stay blessed. I LOVE that sweet little chick holding a note in his mouth and the newsprint behind him – adorable! Love your bright cheerful cards. Such fresh and creative cards! Love them all! Loved your cards and how you used the sequin mixes. That little chick made me smile! Your cards are wonderful. The chickie card is my favorite. Your color choices are amazing! I am so in love with the little bird. Thank you for sharing! Such wonderful cards. Thank you. Your cards are just stunning. I love how you used the gold color with you other color choices. Just stunning. And of course, what's not to like using the “chickie”. Cute, cute card. Beautifully crafted cards, especially love the sweet chick delivering the envelope, so cute!! I love all your cards. The use of the dies is fabulous. LOVE the bright colors in your cards! The bright pink and gold is my favorite! Beautiful! Great cards! Love the visual depth created in the pink and blue cards! Very pretty cards. Love your designs. Love that little chick – so cute! Nice colors on your first two cards and the last one is adorable. LOVE the touch of metallic on the first two cards!!! Magically delicious! Your Just A Note card is so adorable!! TFS! What a great job you've done on these cards, Gayatri! 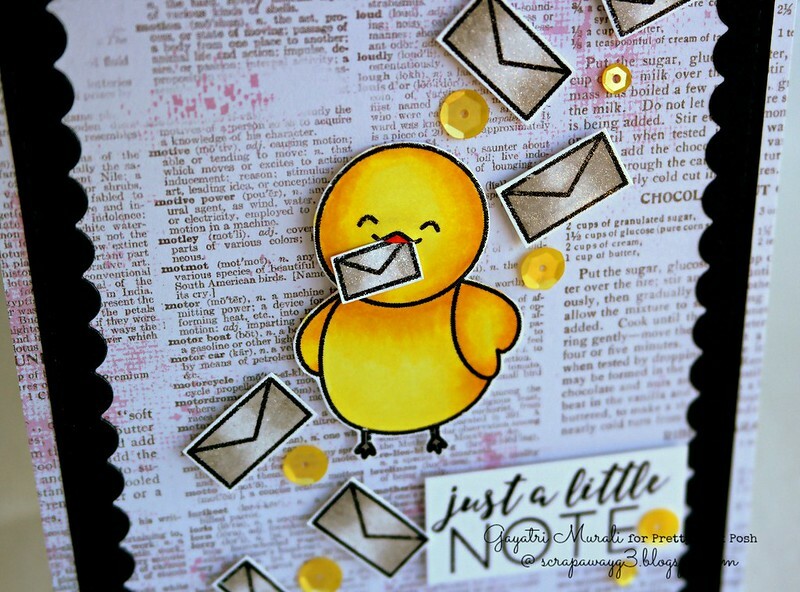 Love the little chick and envelopes! Thank you for joining this fun Blog Hop! Keep up the good work! I really like how you layered the tags and your color selection is wonderful. Great cards. I really like these cards, the Birdie Note one was cute, but I like the Banner cards best and really appreciated the video. I will be looking for your YouTube channel and subscribing. Thanks! Love, love the chick! Looking forward to getting this stamp set! All your cards are beautiful but I'm a sucker for animals! I am very impressed with the pink and blue cards. They are fantastic. It is always hard to find a card for a man, but you hit it right on. Love the layered banners and the sweet little peep card! The first two cards are absolutely stunning. Love the pop of gold against the bright colors. The second is totally cute! between the gold and pink and the cute birdie cards i am on like them overload. so cute! i love all the cards you make! I love the second card. It is so adorable. Fun cards. 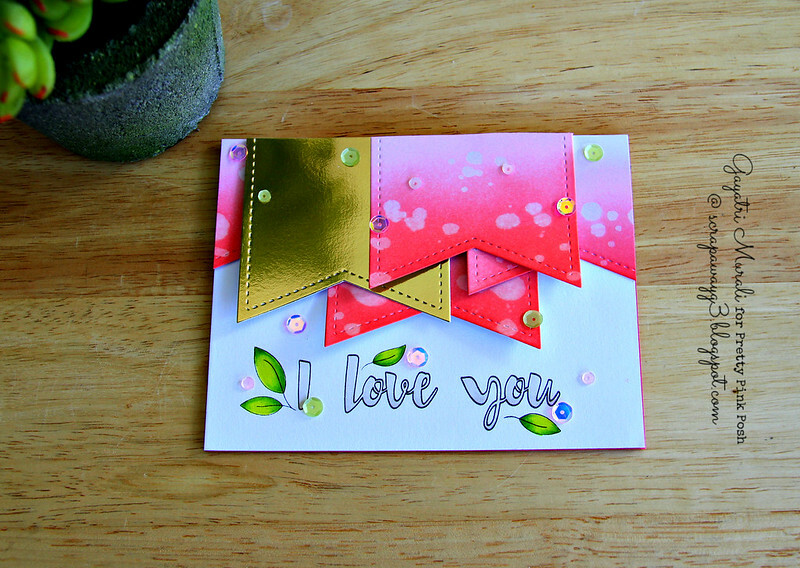 I like the colors on the I Love You cards–so bright and the sequins add such a nice touch. That chick is so adorable on the second card! Thank you for sharing. Very sweet cards! Love the way to used the banner die, so clever! Fabulous cards! Love those banners and that chick is so darn cute! Liking those colours you chose for the pair of cards. The gold is a lovely touch. THat is so cute.. Thanks for sharing,, GReat Inspiration ..
Beautiful cards and your birdie card is super cute! Your “Just a little note” card is so wonderful! Precious! Beautiful cards enjoyed the video tutorial. Love the Birdie Notes stamp set. these are cute..and now you've enabled, already placed an order but now need those yellow sequins for upcoming easter cards. Very cute cards Gayatri! Really love those banners hanging from the tops and the hint of gold! Really makes the card pop. And that last card is so fun, very cheerful! TFS! I like the bit of leather. That cute little chickie stole my heart! It's amazing how different your first 2 cards look – just by changing the colors! So great to see that you used patterned paper, and an older one at that! I've been using other mediums for my backgrounds and have a stack of older papers that come out once in a while – no shame in using up older stuff! 🙂 I think people that get our cards are just happy with a beautiful handmade note! Oh and the gold/gold colors of your cards…what can I say, I LOVE IT!!! what a clever idea with tags, I really like these, so different. Such great cards! Love them! The last card is soo adorable! Great post, fantastic video, extraordinary cards. Just perfect. Love the bold colors in your banner cards! The chick is too cute in the second card! What lovely cards! I love the ombre colors for the tags! All your cards are so beautiful!!! Just like usual, so pretty in your blending of colors and your designs! Had to get that Scallop Frame die after you pointed out it's unique-ness! Thanks for sharing! So cute! I love the Birdie Notes stamp. Better get to ordering so I can snag one. Your cards are pretty. The little chick card is really cute. Nice job. Is there anything you can't do with some ink and stamps! Adore your work! Beautiful cards…I love chik and envelope card, so sweet. that chick is too cute! Your stitched banner die cards are stunning! Thanks for sharing the video. Beautiful cards and I love the bonus card using the sweet chickie image! fabulous set of cards!!! absolutely love the cards you made with all the banners… so cool! Love your cards. Very elegant. Your cards are stunning, love the bright flag tags! The color combos are all wonderful…Very cute cards. Beautiful card! I really like those banner cards but the cute little birdie steals the show!! Great cards! That little chick is just adorable! Nicely done! Wow – those amazing banners are truly the stars of the first two cards! Love the gold banners and the chick is just as cute as can be on your last card. So sweetly framed by the scalloped frame. Fun cards! Thanks so much for sharing. Awesome happy bright cards! Love them! Nice banner cards and cute bird card! Oh,wow! I love how you stacked those banners to create a stunning effect. You are so right: the color combos are just amazing! How lucky are you to get to work with so many cool things! Thanks for sharing. I am so loving the little bird and the tiny envelope!!! Adorable. Beautiful cards, love that cute chick card..adorable!! I love the little birdie! That yellow really pops against the black and white. Makes for an eye-catching card! Your birdie notes card is so fun. These are fabulous and so sweet!! Oh my I love how you use the stitched banner dies and the sequins colors are perfect. Wow! Really love the use of the banners on top! Three wonderful cards! Thank you for inspiring us. The bird bringing lots of notes is so cute. I love all of your cards Gayatri. They are just beautiful. A great video also! Your cards are beautiful and unique! I love how you used the tag dies. And video tutorials are so helpful…I appreciate the inspiration! Wow these are gorgeous! The banners with the touch of gold is really striking. And that little happy chick just makes me smile! Super cute cards! I love the chick with that envelope in his/her beak! I love your ink blending on these cards. Stunning! Love the blue banner card!! Nice job on all three! While both cards are great, I am LOVING the “Just a Note” card. This little bird is adorable and the tiny envelopes are so much fun. Wow, your cards are stunning! I love the stitched, layered banners on the first cards and the falling envelopes and cut bird on the second. Thanks for the inspiration. Love the layered banners. I wouldn't have ever thought of that but it works and looks amazing. I wish my creative brain worked like yours! Wonderful! love Birdie notes and your ideas. Thanks for sharing. Great job! I love the little chick! Beautiful cards!!! Love the little chick and all the little notes!!! The hint of gold in the first two is so pretty!! Such a sweet card with the great PPP Sweet Pea Mix I love those colors. Your cards make a statement!! Beautiful!! Awesome cards! Love the colors! I really like the colors and design of the pennant cards. Very colorful! The bird one is awfully cute, too. 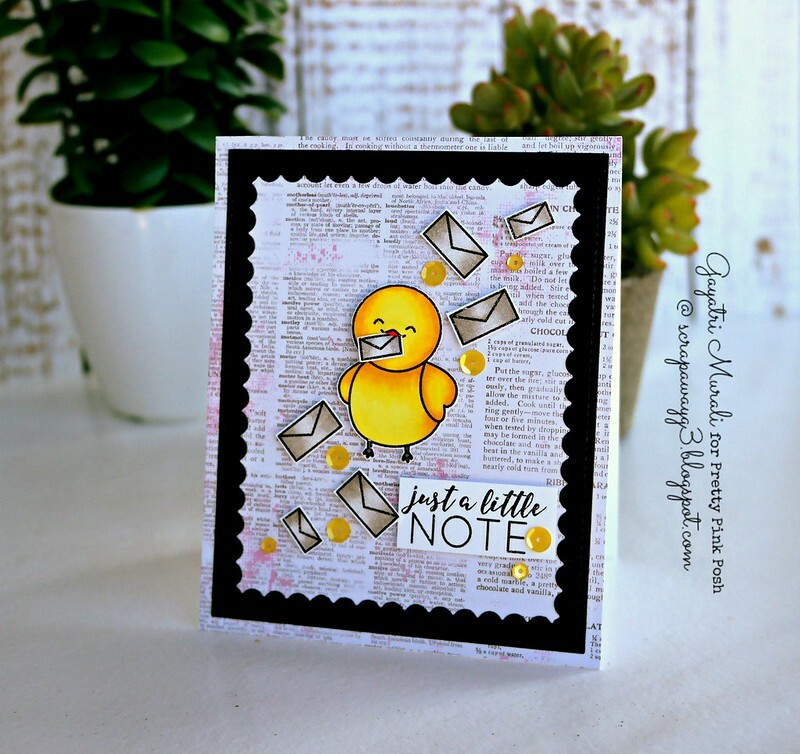 Love the Birdie Notes stamp set, so cute! Love the use of the banners. The just a note card is my favorite. The little bird is so cute. Unique way of using the stitched banner dies. They add that pop of color to the cards. Wonderful cards! Love the design and touch of gold in the first 2. The last one is so cute! Love the birdie and love the background paper.♥ LOVE text paper, I just can never seem to make it work for me. Such an adorable and cheerful birdie! So fun that you inserted some happy mail into its beak! Great idea to create a blue and a red version of your first design. The gold banner is a beautiful touch. So glad to have been brought to your blog on the hop and to have seen your lovely cards. The colors on your cards are stunning! Absolutely beautiful. Great cards! I love the banner pieces! Love the neat cards. The banner one is so unique. Love the colors on the first cards!!! I wasn't sure if that was Copic coloring in the I Love You. Really nice coloring! 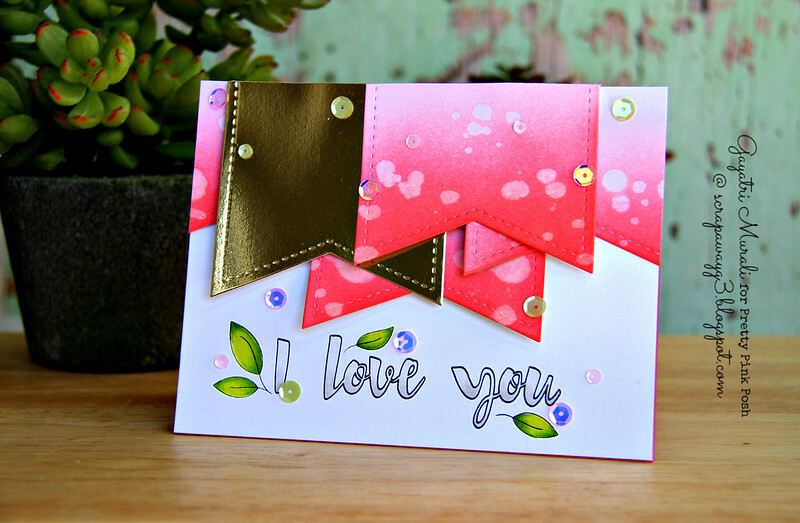 Love your cards – I am so in love with all the new dies from PPP. Can't wait to get some of them! I love the color combos and the birdie! Great cards! How adorable that little chick is with the letter in its beak 🙂 cute! Very creative use of those fish tails! Love all the bright colors on your banner and birdie cards, so cheerful. Beautiful cards. My favorite is the sweet one with the little chick. Soooooo cute! Amazing cards – love the colors! I love the colors used in your stitched banners and how you used the banners hanging from the top of the card. Great cards!! I love the card with the bright yellow bird! So cute!! Beautiful cards, love the colours, and especially the little birdie…so so cute. Love all the banners you used and color combinations of your cards. And your last card with the critter is so adorable. The banner cards are so pretty! Dang…Birdie Notes is no longer available!! I can see why but I can only blog at 2 am. CONGRATS PPP SOLD OUT!! So cute …love the watercolor and gold and of course the sequins!!! So beautiful.! I love the little chick with the envelops! Your cards always make me swoon! Your rich colors are fantastic. I love the PPP dies. You showed them off well. This must be a lot of work. I love the way you used gold cardstock. Love your cards. I love how the colors of the banners came together so nicely (pleasing to my eyes). And the chick … adorable. Great cards! Love the Birdie Notes set! Beautiful cards! Love your placement of the sequins on your designs. Great cards and video. Thanks for sharing. Really lovely! That bird is too cute! Great cards. The chick is so cute! Great job. I love your use of the banner dies. And the little chicken card oh my goodness he's too cute!!! Thanks for sharing. great design! thank you for the video!! What a lovely pair of cards and such a fun little note, too!! I love the chick with the text background and extra envelopes…so cute! Love your cards, love your color combos on the first two and the third one is so cute! I love the look of the banner cards!! Looking for the 3rd day celebration card, anxious to see what you had today. Remember commenting on this one yesterday and they are all great cards. Lovely cards, especially the banners. Awesome cards. Your video was great. The first two cards were so charming. The bird card was so bright and fun. Thanks for sharing your talent. Beautiful and adorable. Love how you used the banners and your little birdie is adorable! I love the fish tails on the first two cards. the layering is great and the colors are marvelous. 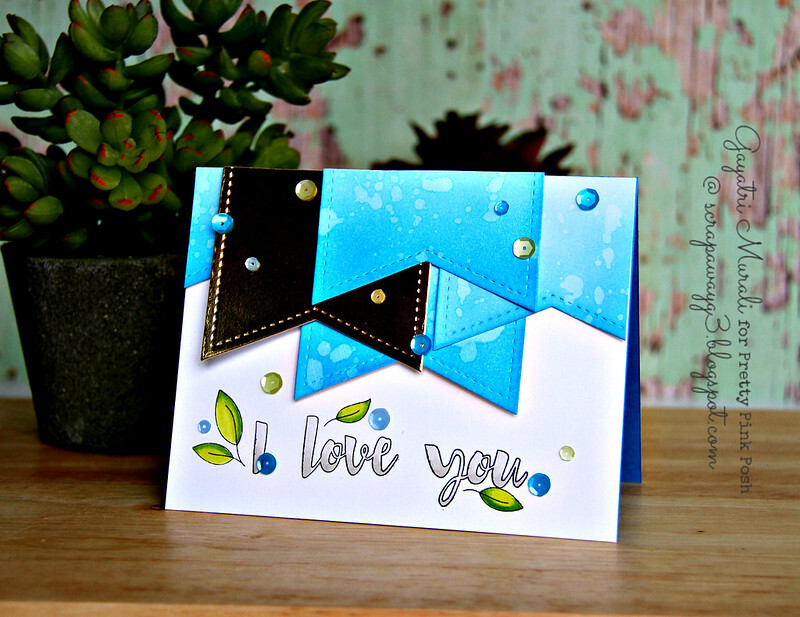 Love the ribbon card – I'm always looking for new ways to use my Distress Inks! Stunning cards, great colors and designs. Love your used of the metallic with the beautiful inked banners, and the print background on your chickie note card. I like the first card, and then I saw the second [blue] one. I LOVE blue! Then came the little chickie one that is so cute. Such amazing work! Thanks for giving us 3 cards. The large banner dies make very bold cards. I love the whimsy of the last card. You matched the color of the sequins perfectly. So cute. Very pretty cards. And the little birdie note card is adorable. Thanks for sharing with us. The birdie card is so adorable! Beautiful cards, Gayatri! Love the PPP dies! Happy Birthday PPP! Thanks, Paulette S.
i'll never tired of distress inks! Your little chick holding the letter is adorable! Love the colors and the gold accents! Great cards – especially like the banner cards & video. That chick is so cute! Can't wait to get my set! I love how you used the print as your background. very cool! Love that cute little chickie & the banner cards are awesome. The vibrant colors really pop & I love the design. Such a clever way to use the Stitched Banners! Thanks for sharing! Your cards are great I'll be coming back to check out more of your designs. I'm looking forward to seeing more of your work. Thanks for participating in this blog hop. Love the layered banners and the adorable chick. Love those vibrant colors on the layered banners and the cute chick card is so pretty too! Love the first 2 cards, one for a woman and one for a man. The little chickie on the 3rd card is so cute! Love those bold banner cards Gayatri. Fabulous cards! The gold banner really makes the card pop! Love the inking on the other banners! Cute little chick card! Omg….great in all color schemes. And the birdie is so cute! Awesome cards, I absolutely love the banners cards! Love your cards! Especially your use of the dies and colors! beautiful! I love your use of color! The first two cards with the bright & gold colors and layout are amazing! Wow! Your third card with the bird and the cool dictionary patterned paper and layout is fabulous!!!! Love Love Love! Fabulous cards! love love love the colors! I'm super impressed with your wonderful cards! Love the cute little chickie holding the note. The two 'love' cards are very striking – love the design!!! Terrific cards! I love the rich color on your tags combined with the single gold metallic one. Very pretty! Great cards! I love how you layered the banner dies on both cards! Thanks for sharing the video too! Great card designs. I really like the chickie. I love both styles of cards! Love all the stitching, too! Both cards are amazing, but I do like the little chick! BEAUTIFUL and SUPER CUTE cards Gayatri!!! WOW – your layered stitched banners are DELIGHTFUL, your birdie SO SWEET and the sequins add the perfect SPARKLE => SO MUCH to LOVE!!! I LOVE blog hops because I get so inspired. Adorable cards but the little note is best. Beautiful work! The banner layers are fabulous and the little bird card is adorable. Well done. Gayatri your cards are very cute, loved specially the second one! Awe, the stitched banners and larger sentiment are a match made in heaven, and the color possibilities are endless. Love those first two cards, and your framed chick is adorable, Gayatri. These items in this new release are to die for! Love this cute and cuddly chickie. It just melts my heart! You seem sweet as well, great job on the cards!! Beautiful designs! The chick with the envelopes is so adorable! Brilliant! I love the little chick card. Great cards love the watercolor look so fun.